It’s game day and you are ready to switch it up. Not feeling the hot dogs or nachos? Try your hand at some delicious meatball sliders. Perfect to serve to family and friends while watching the game at home or prepared ahead of time for a day of tailgating at Metlife Stadium! Combine the ground beef, breadcrumbs, milk, garlic, 1/2 teaspoon salt, and pepper in a large bowl and mix together. Roll into small bite size balls. Cook onion until softened in 2 tablespoons of olive oil ( about 2 minutes); remove onions from pan onto a plate. Heat the remaining tablespoon of olive oil and cook meatballs, turning until all are browned. Add the onion and marinara sauce into the pan and let simmer for about 20 minutes. 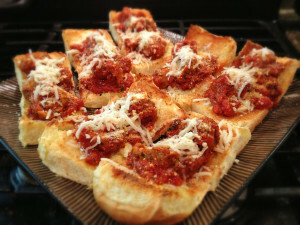 Right before serving your guests, split the rolls open and add a meatball, marinara sauce and top with mozzarella cheese.